Kalalau Valley on Kauai, one of the hot spots on Kauai. The Garden Isle of Kauai offers many striking places for you to see. 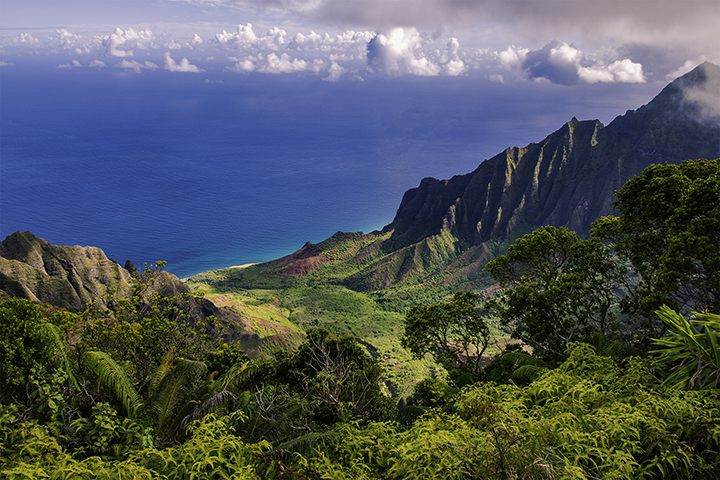 Such iconic places include: Hanalei Bay, Na Pali Coast, Fern Grotto and Waimea Canyon. There are also popular dining spots like Duke’s Barefoot Bar and Grill, the St. Regis Grill and Rob’s Good Times. But some of the best adventures and restaurants are those you haven’t heard of before. To this end, here are some of our favorite hidden hot spots on Kauai. Spouting Horn, another one of the hot spots on Kauai. 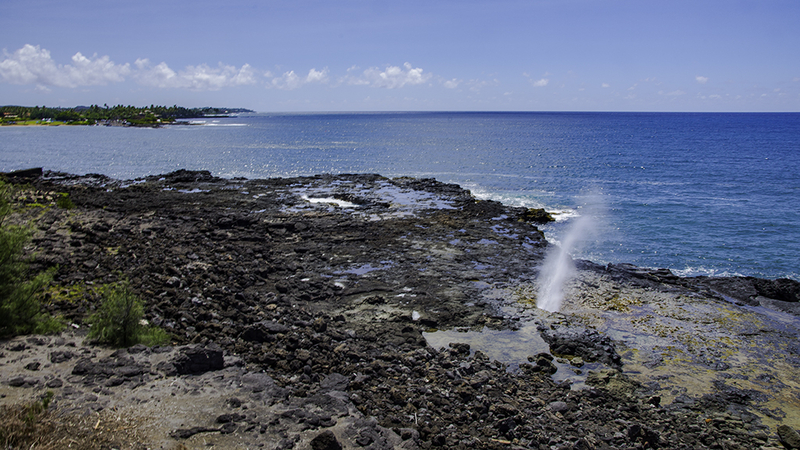 You can see one of the most powerful seacoast blow holes in Hawaii. While at the same time, you can also enjoy the beautiful flowers of the Garden Isle. Drive to the Kauai’s south shore to visit the Spouting Horn and the surrounding tide pools. Across the road is the entrance to two nearby National Botanical Gardens, McBryde Garden and Allerton Garden. The grounds are open to the public and have a wealth of rare and unique tropical flowers and plants. This classic Hawaiian luau includes a performance as well as the traditional roasting of kalua pig. A Polynesian drum show, fire and hula dancing as well as plenty of food are parts of the festivities. Guests can join in on the dancing after dinner and practice hula. If you are unsure of which luau to attend on Kauai, Smith’s Garden Luau is a fantastic choice. If you want really see the island, abandon your itineraries by renting a car for a day. Driving from one side of the island to the other could take about an hour or more. But it depends upon how many places you want to see at along the way. If you see a farmer’s market, stop and sample the island’s fruits while taking in the hot spots on Kauai. One of Princeville’s relatively unknown swimming location is Queen’s Bath. They are actually coastal tidal pools and coves within old lava flows. Off Punahele Road, a short hike past a waterfall over lava rocks will take you there. The tidal pools and coves offer a secluded place to enjoy the waters, but only when the surf is down. Definitely refrain from entering the water when the waves are big. This is definitely one of the best hidden hot spots on Kauai. Don’t confuse this place with Queen’s Bath. This swim spot, a favorite of local residents, is in Polihale State Park near Kekaha. While it’s dangerous to swim anywhere else in the area, Queen Pond is a calm pool of sea water within the sand. As in the case of Queen’s Bath, you should not swim in Queen’s Pond when the surf is very high. The wet and dry caves are pretty well-known spots in Ha’ena Beach Park. But there is another less visible wet cave up a hillside trail called Waikapalae or The Blue Room. This cave earns this nickname as it has a deep blue pool reflecting sunlight through the cave. This creates an eerie aqua glow. It’s definitely worth stopping at this beautiful unique place. Another creative way to see Kauai is to follow a world-class foodie on a weekly culinary tour. Tasting Kauai holds this event at various locations on the island. Every month, the Royal Coconut Coast Association also offers food tours. Here, participants can savor cocktails, traditional foods and local produce. In addition, visitors can meet culinary artists, sample desserts and try menus from an elite executive chef. Kalalau Trail is an 11-mile trek over rough terrain, beaches, waterfalls, valleys and sea cliffs. If that’s too ambitious, a short 2-mile hike will take you to Hanakapaiai Beach. Here, you could potentially see a monk seal or humpback whale. Another great trail is the Canyon Trail at Koke’e State Park. 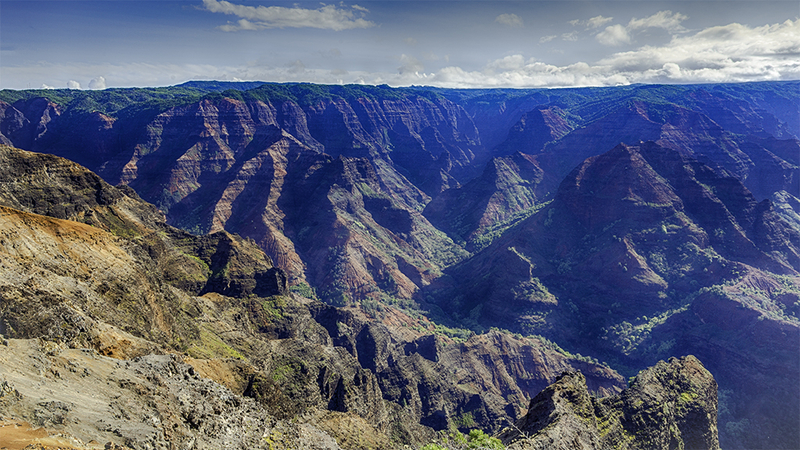 It’ll take you to a 360 degree panoramic view of the Waimea Canyon.